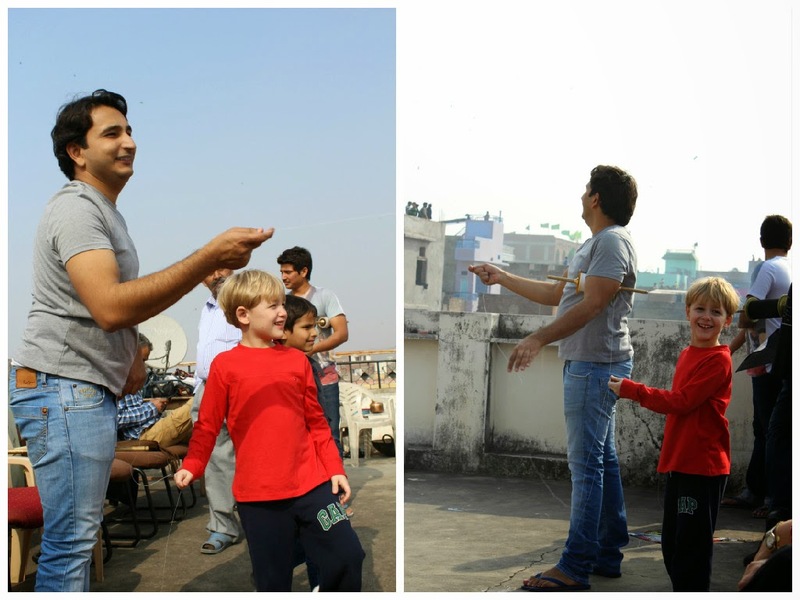 On January 14 we celebrated Makar Sankranti, or "The Kite Festival" for those of us still working on our Hindi skills. This holiday is particularly popular in Jaipur, especially within the walls of the Pink City. My friends and I were invited to our friend Dilip's home to experience the kite festival in the true Indian way...surrounded by wonderful hospitality, delicious food, and great company. Oh, and kites of course! I wish my pictures could depict how many kites there really were. They were everywhere! We were on the rooftop of Dilip's home, so we had the best view. Some of our favorite snacks....on the left are sweets. One reminds me of the center of a Butterfinger and the other tastes like honey. These kites stuck in the tree pretty much sum the whole day up. Being invited into our friends home really was the best way to experience this holiday. Can't complan about great friends and food! I have been a lazy blogger lately! Believe it or not, I have been busy, or at least as busy as an "Indian housewife" can be. And by busy I mean going on sightseeing and shopping trips with my friends. Rough life. 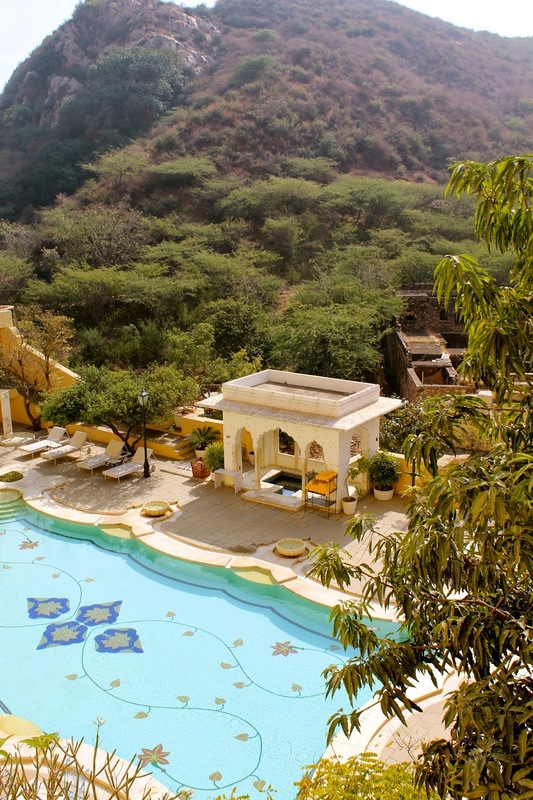 This palace (not sure what qualifies as a palace, more of a hotel), is located exactly an hour north of Jaipur. It was SO quiet here, no traffic to be heard. We enjoyed a relaxing lunch and a tour of the grounds with beautifully decorated rooms. So remember at the end of my last blog, I mentioned I was still digesting our crazy events of that day? Well...I would like to get into detail about the adventure we had, but I don't want my blog to be about bashing anyone, so I'm going to tread lightly. My friend has gotten familiar with a gentleman who lives in a village about forty minutes out of town and employs women of that village to make exported textiles. To give you context, the expat community is VERY small. We get familiar with faces because us foreigners all shop and eat at the same places we deem to be safe and hygienic. Anyways, myself, Marcela, Isilda, and Marcela's visiting mother in law and aunt made the trip to see this place. We are always looking for a new experience. And well, this certainly was. Let's just say there was nothing to see...no products to show us, no one working, and due to the use of various substances, this guys altered mental state made it impossible for us to gain anything of value from visiting him. I did enjoy seeing his property, and there were lots of cute puppies but that was about it. In the end, we spent less time there than it took us to drive, and after being able to quickly assess our situation, we left. We are all lucky to have great drivers that not only get us from point A to point B, but also look out for our safety. Marcela's driver was always nearby looking out for us, so don't freak. This place is also in a travel guidebook for Jaipur... so I feel like that book publisher needs to re-evaluate that. Below is a picture of Marcela's husband Roberto and his mother Rita. They made us a delicious dinner of homemade spaetzle and pork. It was SO good to eat a home-cooked meal and enjoy it with friends. Besides chicken, meat isn't really available here in Jaipur, unless you want a turkey that still has its feet and head attached and is loosely wrapped in a garbage bag. Yum. Roberto works in Mumbai, and him and Marcela have learned to take advantage of India's crappy security restrictions by bringing things such as pork tenderloin, bacon, and steaks in carry on luggage that are readily available in bigger, more modern cities like Mumbai. It may sound strange, but it works! Gotta do what we can to get our groceries. Overall, life is good. My new goal is to see or do something new every week, so I'll have more to show you next time. After a perfect month and a half in the United States celebrating Christmas with my family, I am back to India! This is my first time returning after a trip home that I eased right back into my routine here. Part of this is because of the wonderful friends I have made here. Having girlfriends to go on adventures with makes India so much more fun. Before I show you what I've been up to, I first want to thank everyone who donated to my GiveIndia campaign! I truly appreciate the generosity of everyone. Your donations will be put to use helping the resilient children of Jaipur. Thank you, thank you, thank you! So...right before I left for the U.S. in November, my friends Marcela, Isilda and I went to visit the village of Bagru to see the Block Print House. I had met the owner, Deepak, the week before when he came to Vatsalya to introduce and train village women in block printing. The training of the women is possible because due to the efforts of Vatsalya, monetary support from a national bank, as well as an Australian woman helping to train these women in efforts to sell the products internationally in exchange for fair wages and ethical treatment. The women were very excited to all try the block printing. An area has been set up on the Vatsalya campus in order to train and produce items. I hope it will be successful for them! After talking with Deepak that day, he invited me to visit his workshop and I was excited to see the whole process. The men of his family have been block printers for many generations and export items to Europe, Australia, and the United States. Natural Indigo dye that has been steeped for several years. These men work SO fast creating perfect stamps. All of the dyes they use are natural and come from various plants and herbs. They also do a lot of mud printing, or "dabu resist." They put mud on the stamp instead of paint, and let the mud dry completely. Afterwards they submerge the material in the Indigo dye and then wash off the mud. This leaves the pattern under the mud the original white color and dyes the rest of the fabric blue. It is a very common style, especially in Rajasthan. The blue scarf here shows dabu resist. Here the fabrics are laid outside to dry after being dyed. Marcela was a very focused block printer! We were not as quick or accurate at block printing, but we had so much fun! We worked together to create a beautiful design. I really enjoyed this day in Bagru. It felt like such an authentic experience. After we had our fun block printing, we went to Deepak's home to take chai and we also each purchased a scarf in thanks for showing us around. I appreciated Deepak's effort to explain to us his family's business and welcome us to his home. But for now, I am very happy in India, exploring something new every day!